Our Mothers are the one person that has always been there for us no matter what is going on, and it seems wrong that we celebrate Her only on Mother’s Day every year. And the biggest bunch of flowers or breakfast in bed on her special day just does not express how much we love and appreciate Mommy Dearest in our lives. 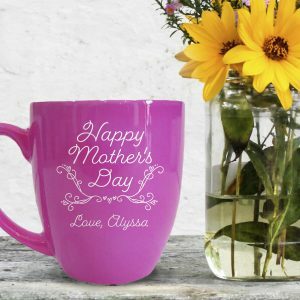 So why not give her a personalized Mother’s Day gifts that will remind her every time she sees it that she is the most special Mom in the World! Our extensive range of personalized gifts for Mom has just about anything you could want for Mom and you are able to customize it with our engraving service absolutely for free. We all know that our Mommy has her own very special way about her, and that is part of makes her so amazing. Our unbelievable variety of custom gifts for Mom, lets you choose the absolute perfect gift for Mom. From jewelry boxes, wine glasses and a host of top-quality accessories for the kitchen and so many other different gift ideas catering for hobbies, work and the home are all easy to find on our site. With literally hundreds of possibilities you are sure to find your Loving Mother the perfect gift. Once you have that special gift our free customization service will help you make your Mother’s Day gift, extra special. You can use the engraving to make your gift unique with a monogram or a special message for Mom. That way, every time Mom uses her gift, she will be reminded just how special she really is and that you love and cherish her every day for all the wonderful things she does for you. Our catalog of git ideas has every type of Mother included, from new Moms all the way to your favorite Granny and we have awesome ideas for Dad to give to Mom that will show her just how much she means to him and the family. Our Mothers really make us feel better when we sad, always have a plaster at hand for the cut on your knee and they have the perfect meal cooked when you need some of Mom’s home cooking. So, we have searched far and wide for extra special gifts for mom so that you can spoil her and show just how much she is the foundation of your home and life. If you are having trouble finding a Mother’s Day gift feel free to reach out to our staff and could guide you in the right way. Maybe give you a few great Mother’s Day gift ideas that you were not thinking about. So, browse our catalog and find the perfect gift for your Mommy and make it the best Mother’s Day gift she has ever received with a message that is straight from the heart with our customized engraving service for free. Oh, and don’t forget the flowers and the breakfast in bed either!